Rin' with Mana Yoshinaga (吉永真奈), Tomoca Nagasu (長須与佳) & Chie Arai (新井智恵) – Rin' is a Japanese pop group (2003–2009) and (reunify in 2019) which combines traditional Japanese musical instruments and style with elements of modern pop and rock music. 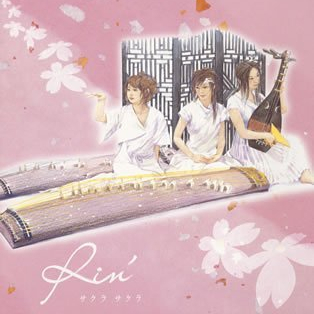 Rin' is a Japanese pop group (2003–2009) and (reunify in 2019) which combines traditional Japanese musical instruments and style with elements of modern pop and rock music. « Yachiyo no Kaze » is Rin’s second single. The title track was used as theme song for the third season of the dorama Omiya-san. The single reached #164 on Oricon charts, and charted for 1 week. It’s the first album of Rin’ released a month after the first single. 8. Smile On: English ver. Jikuu is the first album released by Rin’. The title track was used as CM theme song for Hairmake EARTH, « Fuhen » was used as ending theme song for the anime Samurai 7 and « Sai no Kami » was used as image song for the city of Izu. The album reached #27 on Oricon charts, and charted for 8 weeks. « Sakitama -Sachi Tamashii- » is the debut single. The title track was used as CM theme song for Bourbon Cheese Okaki. The single reached #37 on Oricon charts, and charted for 6 weeks. Rin’ is a Japanese pop group which combines traditional Japanese musical instruments and style with elements of modern pop and rock music. It is a female trio of Tokyo National University of Fine Arts and Music alumni who graduated in 2003. The band made their performing debut in December 2003, at Meguro Gajoen, and in April 2004, their first single, called Sakitama, was released by avex trax. Chie Arai and Mana Yoshinaga play koto, sangen, and jushichi-gen, while Tomoca Nagasu plays biwa and shakuhachi. All three perform vocals. According to the band’s website, the name Rin’ comes from the English word ‘ring’, the Japanese word Wa (和, meaning both ‘ring’ and ‘Japanese-style’), and from the trio’s hope to create a ‘ring’, or circle, of music. Since their debut, the band has performed in many venues around the world, and have released four singles and several albums. A number of their songs have been used as themes for anime and movies, most notable is Fuhen used in the Samurai 7 anime. Their chief international album, Inland Sea, was released worldwide: in Europe and the United States on April 25, 2006 and in Japan on August 30, 2006, featuring guest performances by Leigh Nash  and Lisa Loeb. According to the band’s website, as of 13 February 2009, Rin’ had put an end to their activities and decided to disband · . After 10 years, on March 8 2019, was officially announced on the official websites of each member the reunification of the Japanese Rin ‘Musical Instruments Unit.